I don't know much about panning for gold except that one of our state's football teams is named after the gold rush era in and around '49. I did learn yesterday, however, that we still have gold "dredging" up here in these parts... 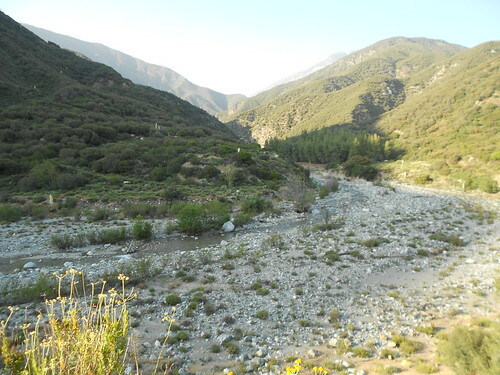 In the Azusa Canyon, about forty miles north of Downey, up where the 605 and the 210 freeways meet, people hike into the hills to the streams and rivers to pan for their chance to strike it rich. 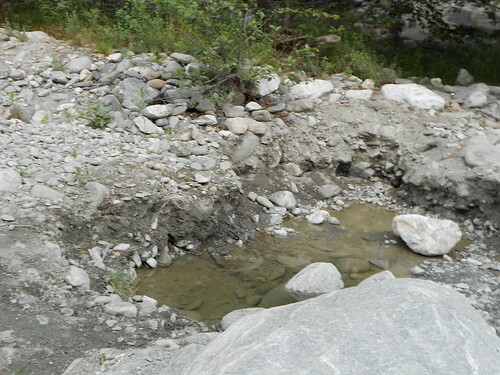 When someone dredges,* they take out part of the river and make a small hole damming it up with larger rocks. They wade in the pool and pan through the silt and sand, not forgetting to look under the larger rocks they've unearthed. Here is what it looks like after someone has dredged out an area. The water has almost gone, but the hole is still there. *as told to me yesterday.